I’m happy that I took the dive into this genetic testing/sharing, but it’s all been very abstract. For the most part, the tests are related to medical conditions that aren’t part of my daily life and experience. 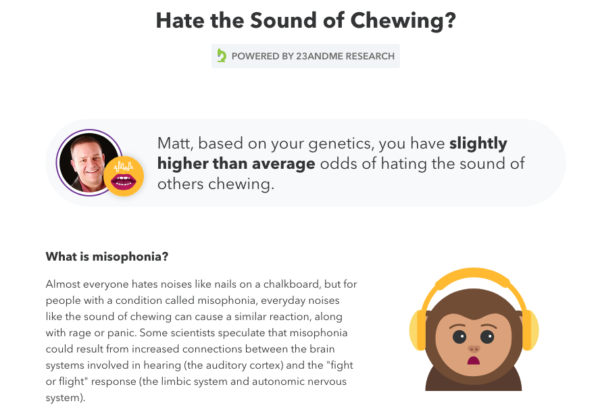 That changed not long ago when 23andMe emailed me about several new reports that they added — one of which was for a minor condition I have called misophonia. I clicked through to read the report and, sure enough, 23andMe says that my genetics make me more likely to have it. It never occurred to me that something like hating the sound of chewing would be a hereditary thing, but that’s apparently the case. Who knew!?!? This is something I deal with every day, which makes it the most visible and tangible connection to my biological parents. And that’s really cool. Less cool is that I’ve also passed misophonia on to my daughter. Family meals are few and far between with half the family not enjoying the sound of other people eating!